Aestas plans to develop AP-251 as a first in class non-invasive PET imaging agent for the early detection of AD pathology (asymptomatic AD), in advance of significant plaque formation or neuronal loss. The company’s unique diagnostic approach utilizes an innovative platform suitable for clinical use in both AD and PD patients. 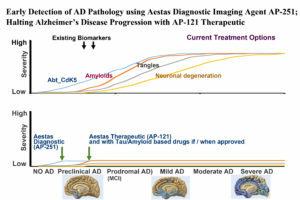 The company’s diagnostic imaging candidate AP-251 has the capability to detect AD/PD pathology earlier than existing biomarkers, and may also be utilized alongside abt_Cdk5 based therapeutics or other Tau / Amyloid based drug candidates as a companion diagnostic imaging agent to monitor clinical outcomes. 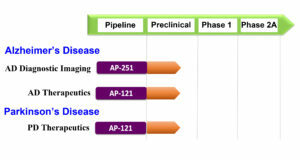 AP-251 may also be developed to screen appropriate patients with abt_Cdk5 pathology, paving the way for a personalized medicine approach to therapeutic intervention in AD and other neurodegenerative disease including Frontotemporal Dementia, Parkinson’s disease, and Amyotrophic Lateral Sclerosis. The company’s unique therapeutic approach utilizes an innovative intranasal delivery platform suitable for clinical use in both AD and PD patients.Both diagnostic and therapeutic programs will have significant crossover benefits for manufacturing processes.